The Flappy Bird phenomenon has been startling in its scope and vigor, but let’s face it. A game with a cute bird and dead-simple controls is not a hard sell on the App Store; this is established fact. Asher Vollmer and Greg Wohlwend’s Threes, however, faced a struggle to win players’ affection. Threes, which has hovered near the top of Apple’s paid-game charts for much of February, does not star anything fuzzy or cuddly. Its only characters are numbers—mostly multiples of three, with a supporting cast of ones and twos. And they don’t even flap. In other words, Threes looks like a math game at first blush. But the only math involved is kiddie arithmetic. 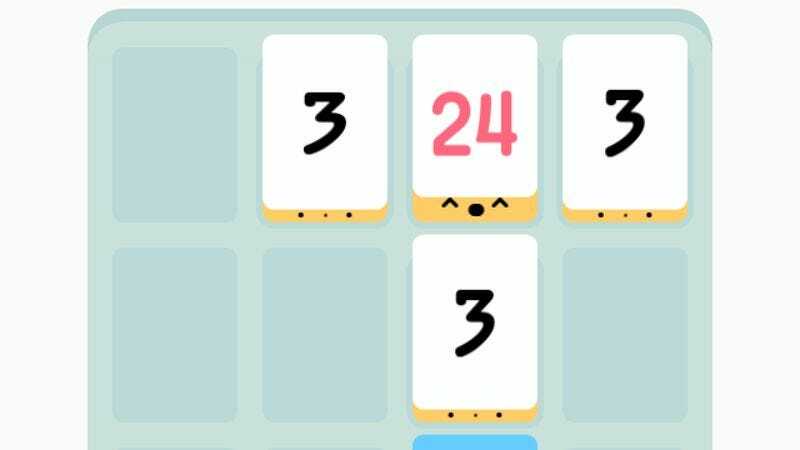 Spend a little time with Threes, and it reveals itself to be a rich, charming puzzle game, one that tests your ability to recognize patterns and execute complex strategies in a confined space. Before players can experience those delights, though, they have to get over the hump of first impressions. The game’s creators have smoothed that process with a tutorial that recasts cold numerals as cute characters—and provides an understated rundown of the rules, to boot. This is the first screen of Threes’ tutorial. With a single word, “meet,” Vollmer and Wohlwend establish a rapport. It’s silly to introduce people to one and two—they’re among the most well-known numbers in the business, right up there with three and of course the venerable 20. But this matter-of-fact greeting sets a cute tone without being cutesy. The other text at the bottom feels more like an afterthought than an instruction. “Swipe anywhere to move them” is the only thing you can do in this game—you slide the numbered tiles around the grid and smush them into each other to create ever-higher numbers. So with this almost vestigial snippet of text, Threes teaches you its entire control scheme. This is a crafty teaching approach. The developers greet you with friendliness front-and-center and slide the tutorial under the door. It takes confidence to soft-pedal the actual tutorial content. Too many mainstream game studios build their opening tutorials to leave no possibility of misunderstanding—they browbeat you out of fear that you won’t get it. Vollmer and Wohlwend instead designed the beginning of Threes in a way that encourages organic understanding. The game assumes that there’s a reasonably intelligent and playful person on the other end of the line. Later in the tutorial, after you’ve mashed the one and two against the wall to produce a three, the numbers-as-characters motif deepens. The messages on the screen here are redundant: They both give you the same information, telling you the same thing twice. But one treats the numbers like little creatures (“twins”), and the other boils it down to bare-bones facts. This is the clearest example of Threes’ two-tone approach: silliness complementing straight talk. Once again, silliness gets top billing. Here I’ve made two sixes, and I’m about to slide them together for a 12. The sixes gaze into each other’s eyes in anticipation of their mathematical destiny. This is one of the earliest glimmers of personality in the numerical cast of Threes. Later, the tiles will grumble, sigh, and playfully heckle you as you consider the board. The bigger numbers have bolder, more fully formed personas than the little ones. The tutorial is charming because it holds the promise of more whimsy; the game is charming because it delivers on that promise. Squint at the bottom edge of my phone, and you can make out a flat “mouth” and two “eyes,” just like the low numbers in Threes. A coincidence, maybe. Or maybe Vollmer and Wohlwend are subtly riding the coattails of our natural affection for our devices. After all, when you spend a lot of time using your phone, you develop a certain attachment to it. The character design of Threes’ tiles subconsciously prompts us to extend the same fondness to them. The tutorial concludes with a call to action: “Make the highest number you can!” This is my favorite bit of misdirection. Sure, the goal of Threes is to keep mashing numbers together to produce ever-higher multiples of three. But if you focus only on the high numbers, you’ll run into trouble. After you play the game for a while, you learn that you have to balance your attention between the big numbers and the lowly ones, twos, and threes that continually spawn onto the board. Threes leaves you to find the nuances of that balance—and other layers of strategy—for yourself. That is, the tutorial knows when to stop talking. Threes is a game of surprise. Over the long term, that surprise comes from discovering the sophisticated tactics and mathematical patterns that lie beneath the surface of this deceptively simple game. The only trouble is, it takes a while to appreciate those finer points. So in the meantime, Threes catches you off-guard by giving you character where you don’t expect it. It’s an ingenious way of extending the game’s spirit of surprise to obscure its learning curve. Threes may deal in numbers, but it thrives on the basis of its unquantifiable appeal.